Thank you to the Eva Perry Library and everyone who came to see me today! Tzatzikii for our spread. After that we sampled our vegetables that were delicious! Spinach, red peppers, yellow squash, zucchini grated carrots and purple cabbage. We took a whole wheat tortilla, spread our favorite hummus or Tzatziki and topped it off our rainbow of vegetables. We got to take a few bites and then took a group photo with our aprons that were donated by Horizon Group USA. Please visit their Facebook page about the event. https://www.facebook.com/HGUSA. The kids could not wait to get back to the table where they got to sample a variety of Chobani yogurt and cheribundi drinks. I encouraged them to start cooking and enter my contests and the Kiwi 2013 New Chef contest. The afternoon was a great success with many kids trying new fruit or vegetable for the first time. We even heard some parents say that they were so glad that they came as they never thought that their kids would try these new foods and like them. Thank you for having me! Visit my You Tube Site to enter my very first video contest for kids in the USA 12 and under! I would like to invite kids in the USA who are 12 and under, with their parents or guardians permission who are 21 or older, to enter my very first video cooking contest for kids. 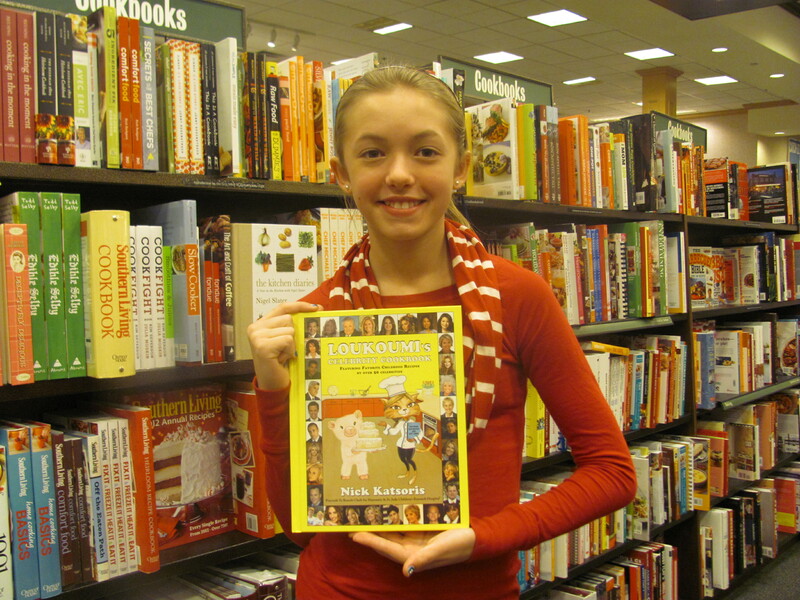 This month’s contest is all about your favorite childhood recipe with a Loukoumi’s Celebrity Cookbook signed by the author, Nick Katsoris as the grand prize and second place a custom apron from Horizon USA. Please visit my You Tube site for all of the details. The contest ends on April 13th, 2013. Good luck and have fun cooking! Pick up a copy of Cary Magazine today and read about me on page 32! I would like to thank everyone at Cary Magazine for the wonderful feature article about me in your March/April issue. It was an honor to have Ms. Christa Leupen come to Bruegger’s Bagels with me and also to my home for my interview. Mr. Jonathan Fredin, who took the photos, took so much time to get many shots and enjoyed my shrimp mango taco. I will never forget this opportunity.